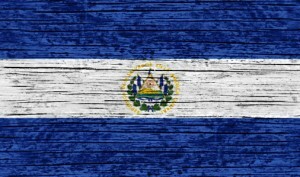 El Salvador is the smallest country in Central America and is smaller than the state of Massachusetts. This mountainous country is bordered by the Pacific Ocean, Guatemala, and Honduras. Known as the Land of Volcanoes, El Salvador has frequent earthquakes and volcanic activity. It is the only country in Central America that does not have a coastline on the Caribbean Sea. Along the coastal plains, there are palm trees and tropical fruit trees, such as mango, coconut, and tamarind. Armadillos, snakes, and iguanas also inhabit the warm, humid coast. High in the mountains, at the 7,931-foot (2,417-meter) summit of Monte Cristo Mountain, is a cloud forest in the international nature preserve of El Trifinio. The governments of Guatemala, El Salvador, and Honduras are trying to protect this rain forest. The cloud forest is home to orchids, ferns, spider monkeys, jaguars, anteaters, and many bird species, including green toucans. El Salvador has a tropical climate with pronounced wet and dry seasons. Temperatures vary primarily with elevation and show little seasonal change. The Pacific lowlands are the hottest region, with annual averages ranging from 77°F to 85°F. Water temps are between 78F and 86F year round. During the rainy season (May through October), rainfall usually comes from low pressure over the Pacific and for the most part falls in heavy afternoon thunderstorms. We are 45 minutes away from the airport; cab fares run about $50. For bigger groups, we can arrange for safe and reliable VIP shuttle service for $25 per guest.